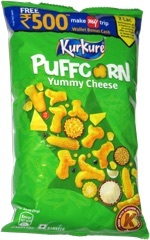 Taste test: This bag included three different kinds of chips. All were rippled, crisp, very crunchy and coated with sea salt, but they were made from three different kinds of potatoes. 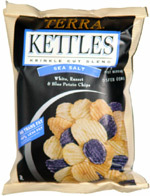 The "blue" ones were really more like purple, and they had a somewhat dry feel and a very good potato taste. They were a bit more irregular than the ones pictured on the bag, as some of them had ligher-colored edges. It was hard to tell the different between the whites and the russets by appearance, but they had very distinctive tastes. The russets were very dry tasting and quite good. I thought the white ones had kind of an odd taste to them. It wasn't really bad, but I definitely didn't like them as much as the others. Smell test: Very, very mild potatoey aroma.